To have democracy, you have to have civil society. In the broadest sense, the term is inclusive of everyone who lives in a given country or federation of states; in a more restricted one, it means all those who possess citizenship and can exercise the rights and responsibilities that come with it. A civil society isn’t necessarily democratic, but it may be or become one for those who embrace its burdens and opportunities. Civil society isn’t necessarily civil. A democratic society means a pluralistic one, and pluralism means a competitive marketplace of ideas, values and beliefs. The competition can be rough, and the stakes can often seem high. Democracy only works if majoritarian sentiment provides accommodation for minority views. Including distasteful ones. You need a high tolerance for difference, and protection for it as well. All of this makes for the possibility of friction on many levels. The friction can be bracing and vitalizing, but it can make for or reflect harm. This is true of any democratic society; it is true of ours. You can have a civil society without popular debate or decision. In the monarchies that preceded democracy, this was the norm, and patriotism was identified with a sovereign who was generally accepted as the source of the law and the enforcer of it. Our democracy evolved out of the monarchy that originally ruled us — that of England. When we decided to govern ourselves as a republic, we set ourselves down the path to democracy. Abraham Lincoln described it as government of the people, by the people and for the people. It is our ideal, if not our fully or even adequately achieved reality. For us to give it up, if or when we do, is to give ourselves up. At the same time, our democracy is not only about differences, but divisions. These divisions are carved into our history and the fiber of our being. We began as a slave society, a substantial portion of whose population was not recognized as part of human, let alone civil society. That cleavage remains with us as racism, and its consequences as poverty and inequality. We thought we had made some progress to transcend this legacy with the election of an African-American president. In fact, this unexpected step forward has now forced us two steps back. There are many other divisions in our body politic: gender, sexuality, religion and sectionalism. We have just had an exceedingly painful demonstration of the habits of thought and behavior that still oppress women and deny them their rightful voice. We have not yet fully embraced the separation of church and state that our founding fathers intended, and with it the understanding that churches are as fully subject to the law of the land as any other institution. We are still in many ways fighting the Civil War that nearly destroyed us as a nation and martyred our greatest leader. We understand these divisions if we do not always appreciate their depth and intransigence, and try to cope with them. We try and often fail, or succeed for a while and then fall back. But what is perhaps our greatest division is the one we appear to recognize the least. That is class. The division of older societies by differences of wealth and status, including ones now democratic, is a part of their historical DNA, and that elites typically rule them despite the formalities of elections does not take them by surprise. When we turned our backs on aristocracy and monarchy, however, embracing at least rhetorically the idea that freedom and equality were inseparably entwined, we uniquely defined ourselves as individuals responsible for our own destiny for good or ill. This is a fine ideal, but it is a very poor description of the facts. When America was still a land of open spaces — that is, of ones taken from its native inhabitants — it was possible for some of the more enterprising to make their fortunes. But when capitalism and industrialism conquered the frontier, the concentration of wealth and power in the hands of a few created what contemporaries called the Gilded Age. The reforms necessitated by the Great Depression and the global hegemony afforded us by World War II temporarily mitigated our profound structural inequality, but in the past 50 years a new Gilded Age has taken shape, and is now fully upon us. This second Gilded Age is no more an accident than the first one was, and it has many of the same attributes: giant corporations effectively beyond the reach of the law; runaway monopoly and technology; captive political parties, legislatures and judiciaries. Its flashpoint, at the moment, is the Supreme Court confirmation of Brett Kavanaugh, a scion of privilege, groomed for power as an ideologue and credibly accused of sexual assault against a minor, whose vote has now given the Court a license to roll back decades of hard-won gains for labor, civil liberties, minority rights and environmental regulation for decades to come. 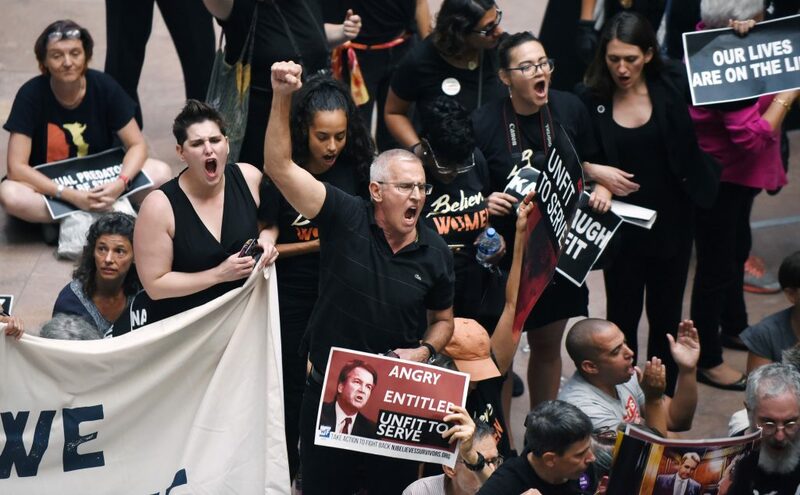 Kavanaugh represents the culminating moment of an orchestrated effort to consolidate elite control of our economic, social and political processes, and to nullify democracy in all but name. Those who’ve suffered its consequences are angry and bewildered; those who fear the consequences yet to come are loud (if thus far ineffectual) in protest. This apparent epidemic of bad manners — of incivility — has been called by solemn pundits “tribalism.” We have, we’re told, increasingly retreated into ethnic, gender and other isolating enclaves that confront rather than reason, and thus can no longer strive for the common good on which a democratic polity ultimately depends. This, I submit, has it backwards, elevating to a cause what is in fact a symptom of massive social and political dispossession. Yes, we are divided, and that division has exacerbated each and every one of our lesser differences. But the division is between obscene wealth and structural economic inequality; between the few with power and the many without; between those in the palace and those outside the gate. Our democracy is embattled as it has not been for nearly a century, and if we want to save it — that is, save it as a goal to which we can still aspire — we will have to fight hard and fight smart.